It seems to me, though, that there is at least one thing left to say, one thing that I’ve not heard amidst the talking heads, one thing that’s being drowned out by the outrage: I’m not all that different than Donald Sterling. @kpelton: Important Sterling takeaway: If it's so hard to get rid of an embarrassing owner, the vetting process better be airtight. What Pelton is referring to here is the vetting process done by the NBA and other owners before giving a prospective owner the opportunity to buy into their most exclusive of clubs. 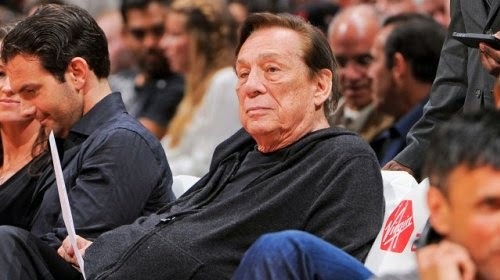 There have been many calls for the NBA to “force” Sterling to sell the Clippers, but there doesn’t seem to be any kind of precedent—or legal recourse—to make that happen. Pelton suggests that if kicking an embarrassment out is impossible, the league should make extra sure that they don’t let embarrassments in in the first place. Here’s the pertinent fact for our discussion: We are all embarrassments! Too often, we think of Christianity as an NBA-like exclusive club from which we’d like to keep potential embarrassments. When someone on the inside has a public “fall from grace,” we wonder aloud to each other if they were ever truly members in the first place. We keep our vetting process airtight, praying that our club avoid embarrassment. If Jesus had an NBA-style vetting process—designed to keep the Donald Sterlings of the world out—we’d all be barred from entry. We might not be racists, but if we look closely enough at our feelings, motivations, and most closely-guarded secrets, Pierce’s description of “a man who would have to yield his moral pride of place to algae” might fit a little too well for our liking. We need a God who, in Christ, does not vet. We need a God who knows us to be the needy, prideful, prejudiced, self-glorifying Donald Sterling people that we are, and who comes to us in our need. We need a God who doesn’t wait for us to clean up our act. Donald Sterling has proven himself an enemy of the NBA, and the NBA is going to do all it can to punish him for it. Jesus Christ, on the other hand, was sent on a mission specifically to rescue his enemies (Romans 5:10). It might be fair for Donald Sterling to lose his NBA team. That’s for lawyers to decide. We need a God who is better than fair; in fact, a fair God leads inexorably to our destruction. We need a God of mercy. And in Christ, the rescuer of enemies, we have one.